The country should immediately enforce the National Clean Air Programme, which will address air pollution. The Centre has asked four cities in Karnataka and 13 other cities across four states to prepare an action plan to reduce pollution levels. Bengaluru: Despite the Centre’s direction to the state to submit an action plan to the Central Pollution Control Board (CPCB) on tackling air pollution, which is higher than the national ambient air quality standards, Karnataka is yet to submit the plan, putting the lives of its citizens and future generations at grave risk. A reply to a Right To Information (RTI) query reveals that none of the four cities – Bengaluru, Davangere, Gulbarga and Hubballi-Dharwad have submitted the action plan to the CPCB on tackling air pollution. According to the Greenpeace India’s Airpocalypse II report, released earlier this year, the annual average levels of PM10 were beyond permissible limits not just in four cities but in ten cities in the state. The Centre has asked four cities in Karnataka and 13 other cities across four states to prepare an action plan to reduce pollution levels. 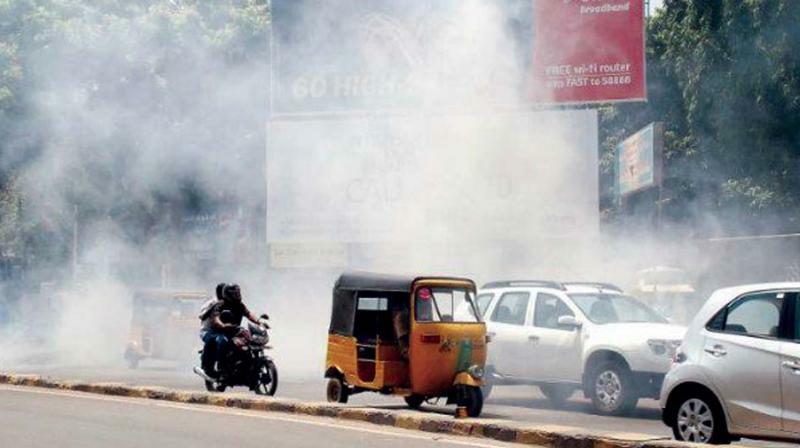 But 36 cities in Karnataka, Tamil Nadu, Andhra Pradesh and Telangana have particulate pollution levels higher than the national ambient air quality standards. The country should immediately enforce the National Clean Air Programme, which will address air pollution. As per the draft NCAP released in April for comments, city and regional action plans will play a crucial role in reducing air pollution. “These action plans should be formulated on time to reduce pollution. Soon after the monsoons, pollution levels are likely to increase. This can be avoided only if concrete action plans are implemented before that,” Mr Dahiya said. Of the 13 identified cities in the South, only three are ready with the action plan and have started implementing it.